Russian apologist and critical compiler from rabbinical works; born at Moghilef April 15, 1815; died at Gluchof Feb. 18, 1888. He was a lecturer in the rabbinical seminary of Jitomir from 1853 until the institution was closed in 1874. Zweifel was a collector of excerpts and quotations from rabbinical literature, which he used in all his works to such an extent that they comprise about three-quarters of the text. One large "yalḳuṭ" of his compilation was burned, and only about a tenth of the original work was saved from the fire that once destroyed his house. Zweifel acted as a mediator and peace-maker between the various Jewish sects, and was especially prominent as a protector of the Ḥasidim. He also defended the Karaites against the attack of Deinard, and even had a good word for Reform ("Sanegor," pp. 38-41, 43). He endeavored also to give a Jewish coloring to Spinoza's philosophy, and quoted fifty opinions, most of which, including that of Besht (Ba'al Shem-Ṭob), were in harmony with the philosopher, while he himself contended that the only difference lay in the fact that Spinoza used words without careful discrimination to explain his system ("Shalom 'al-Yisrael," iii. 43, ed. Wilna, 1873). Zweifel was a prolific writer and one of the first to use Talmudic and idiomatic Hebrew for the modern poetry which he frequently composed, stanzas being interspersed throughout his works. He was also a talented and epigrammatic Yiddish author, and some of his productions in that field were published in Spector's "Hausfreund." Zweifel is best known through his apologetic "Shalom 'al-Yisrael," a work in four volumes, two of which are marked "part true." He based his defense on the ground that "Beshtism" ( ) is the development of the views expressed in the "Moreh Nebukim" of Maimonides, the "Ḥobot ha-Lebabot" of Baḥya, and the "Mesillat Yesharim" of Moses Luzzatto. He showed also that similar ideas were found in Luria's cabalistic system, and demonstrated that the Ḥasidic minhagim were mere repetitions of what had already been recognized in the Talmud and in early literature by Philo and other Alexandrian Jews ("Shalom 'al-Yisrael," i. 47a). He claimed, moreover, that the prejudice against the Ḥasidim and the persecutions which they were forced to endure at the hands of their opponents were as unjust as the oppression of Jews by Christians (ib. vi. 59). He admitted, however, that Ḥasidism had changed somewhat since the time of Besht, and that the rank and file of those who professed Ḥasidism no longer strictly followed the ancient path. He accordingly urged the leading rabbis or ẓaddiḳim, especially R. Mordecai of Czernobel, R. Israel of Razun, and R. Mendel of Lubawicz, to instruct their thousands of adherents to weed out the idlers among them, and to refrain from denunciations and appeals to the government in their petty quarrels, likewise imploring them to cease introducing innovations into minhagim (ib. iii., end, ed. Wilna). Zweifel was bitterly criticized by the Maskilim for his apologetics and panegyrics of the Ḥasidim. Ḥayyim Selig Slonimski, his colleague in the rabbinical seminary, made a public protest, declaring that Zweifel's opinion was not shared by the faculty and that he trusted it would make no impression on the students ("Ha-Meliẓ," viii., No. 37; comp. also Nos. 42-45, 47). Some remarked that his name Zweifel (= "doubt") was indicative of his wavering and unbalanced mind, and J. L. Gordon hesitated to take Zweifel seriously ("Iggerot Yeleg," ii. 277), while Isaac Hirsch Weiss regarded his efforts to harmonize the factions as unavailing, all refutation of false accusations against Jews in general being superfluous or useless, though he admitted Zweifel's good intentions and the value of his works taken as a whole ("Ha-Asif," iii. 152). The works of Zweifel are as follows: (1) "Minnim we-'Ugab," containing a poetical introduction in which the numerical value of the letters of each line is 1,856 (the year of issue), notes on various passages of the Bible and Talmud, poems, and a collection of sayings entitled "Pirḳe de R. Eliezer ha-Ḳaṭan" (Wilna, 1858); (2) "Musar Ab," containing the letter of admonition addressed by Maimonides to his son Abraham, the ethical will of Judah ibn Tibbon to his son Samuel, together with notes and explanations, and 150 proverbs (Jitomir, 1865); (3) "Pardes Rimmonim," explanations of legendary haggadot in the Talmud, by Shem-Ṭob Shaprut (first ed., Sabbionetta, 1554), edited with an introduction and remarks (Jitomir, 1866); (4) "Liḳḳuṭe Ẓebi," a collection of remarks on the Bible and Midrash by Hirsch Ẓebi Segall of Kovno, edited with introduction and notes (ib. 1866); (5) "Tushiyyah," stories and poems, chiefly translations from Russian and German (ib. 1867); (6) "Ḥomer be-Yad ha-Yoẓer," an ethico-philosophical commentary on Pappenheim's liturgical hymn "Ki Hinne Ka-Ḥomer" for the eve of Yom Kippur, with notes, a eulogy on Solomon Löb Rapoport, and similar material (ib. 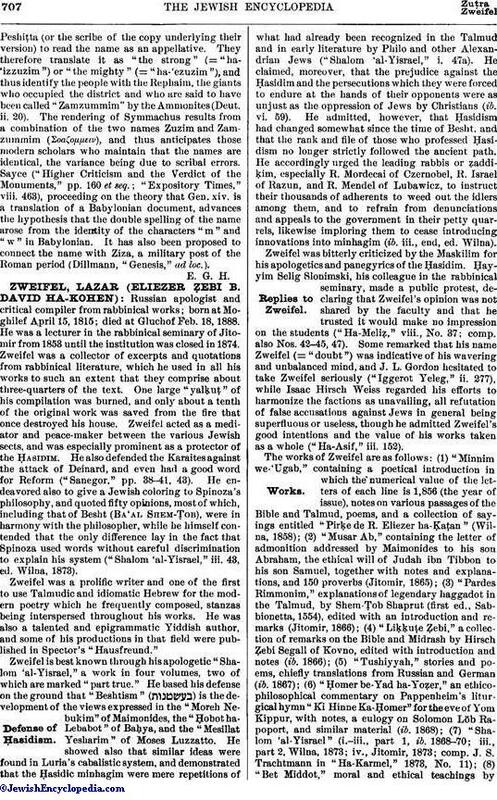 1868); (7) "Shalom 'al-Yisrael" (i.-iii., part 1, ib. 1868-70; iii., part 2, Wilna, 1873; iv., Jitomir, 1873; comp. J. S. Trachtmann in "Ha-Karmel," 1873, No. 11); (8) "Bet Middot," moral and ethical teachings byJacob Löb Margolioth, with notes (Jitomir, 1870); (9) "Ḥeshbon shel 'Olam," on theodicy (Warsaw, 1878); (10) "Neẓaḥ Yisrael," the vitality of the Jewish nation explained by the teachings of Judaism (St. Petersburg, 1884; reprint from Zederbaum's "Meliẓ Ehad Minni Elef"); (11) "Sanegor," a defense against the accusation of materialism and Talmudic Judaism, divided into five sections and giving historical explanations (Warsaw, 1885; 2d ed., Wilna, 1894; comp. J. L. Freidkin in "Keneset Yisrael," i. 242; Berdyczewski, in "Bet ha-Midrash," i. 87); and (12) "'Olam Ḳaṭan," or "Klein Weltel," a Yiddish poem reprinted from "Ha-Ẓofeh" (London, 1894). 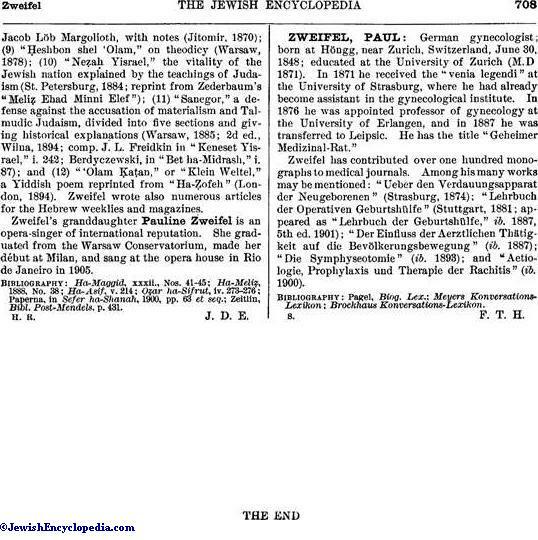 Zweifel wrote also numerous articles for the Hebrew weeklies and magazines. Zweifel's granddaughter Pauline Zweifel is an opera-singer of international reputation. She graduated from the Warsaw Conservatorium, made her dέbut at Milan, and sang at the opera house in Rio de Janeiro in 1905.